This is what one skein of Cascade Cotton Rich gets me in the back of Trellis. Six inches. 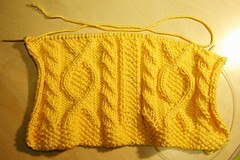 Working on finishing a few other projects and need to go buy some knitting needles suitable for socks. Okay, perhaps not finish, but inch closer to completion. Incidentally, it took me a skein each (80 yards each) to complete the fronts. I purchased 6 skeins estimating that this would hopefully be enough with some left over. Yeah, we all know how that story goes. Right now it looks as if the back will take two balls, the fronts take one ball each, the sleeves will probably need 1.5 balls if I'm lucky. But then there's the collar and the seaming. There was no swatching, either. Luckily, at $4.80 a hank, it isn't such a expensive endeavor to get a bit more to be on the safe side. But I'm going to live dangerously until this little cardigan mocks my yarn estimation skills. It will taunt me at 3 am while Hollis is out of town. Riiight when I thought I had enough to seam it up. Or finish the edge of a collar. On a side note, I might redo one of the fronts because my button holes look like I ... They're just pathetic. Like I took a finger and stuck it in between the stitches until there was a semblance of a buttonhole. This page contains a single entry by freecia published on July 10, 2005 6:26 PM. firefox saved form info tip was the previous entry in this blog. Rock It like a Rocket! is the next entry in this blog.